In the opening scene of Backcountry, Jenn (Missy Peregrym) and Alex (Jeff Roop) are driving through the woods as Dwight Twilley Band’s “Looking For The Magic”—a tune anyone reasonably well versed in contemporary horror will recognize as the unofficial theme of You’re Next—plays on the radio. In a film where every detail is very deliberately placed—we get not only Chekhov’s map, but also Chekhov’s bear spray, Chekhov’s flare, and Chekhov’s cell phone—it would seem that including a song so strongly associated with a recent horror film would be a clue, a winking reference to the kind of movie we’re about to see. But there’s nothing winking about Backcountry. Canadian writer-director Adam MacDonald’s debut feature has some inarguably clever elements; simply devising a story that could be shot with a minimal cast (Jenn and Alex are alone in the woods for most of the movie) in an inexpensive outdoor location that isn’t a “cabin in the woods” scenario shows intelligence. With that in mind, however, it becomes difficult to overlook the boilerplate characterization of the leads. He’s a wildly overconfident amateur outdoorsman who likes the movie Legend. She’s a tightly wound lawyer glued to her cell phone. They engage in rote relationship banter. Repeat. But the point of Backcountry isn’t to get involved with the characters. It’s to watch someone get graphically mauled by a bear, a feat accomplished with a real black bear and some Night Of The Living Dead-style butcher-shop effects. The bear attack scene is arguably the most compelling part of the film; it comes on quickly after some extended foreshadowing and unfolds in a series of shaky, deliberately confusing shots that make the eventual, sickeningly realistic unveiling of the resulting carnage all the more shocking. But let’s back up a bit. Alex has brought Jenn to hike the Blackfoot Trail, a trek he has made many times before. After declining the park ranger’s offer of a map, the two set off in a canoe for what is supposed to be a romantic bonding experience. There are signs of trouble from the very beginning, including an unsettling visit from a local wilderness guide (Eric Balfour, doing a passable Irish accent) who challenges Alex’s already-vulnerable manhood. Then everything that could ever possibly go wrong on a camping trip goes wrong, including but not limited to the aforementioned hungry bear. 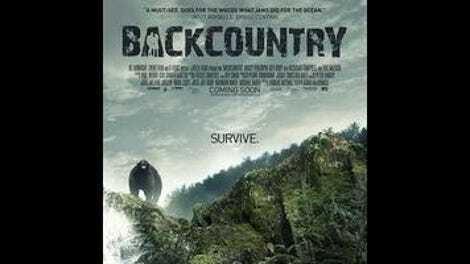 Sporting a “based on a true story” title card, Backcountry is potent in its moments of sheer animal panic, reminding the viewer that humans, for all our advanced technology and intellectual vanity, are powerless against the faceless cruelty of nature. Peregrym in particular is put through her paces; her physical performance is commendable, even though her character gets less interesting as her hardships increase. But without effective characterization to drive the moments in between, the spectacle of humans painfully, extensively, gratuitously suffering for their arrogance is more sadistic than thrilling.